Devoted to all things food, Hyundai Card’s latest project is an establishment where visitors can eat, cook and read about eating and cooking. 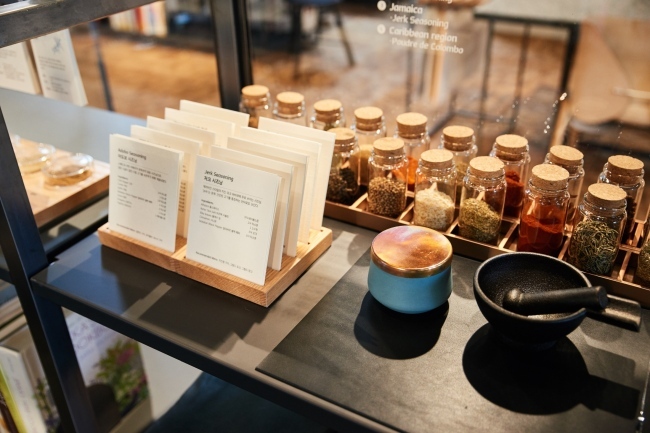 Called Cooking Library, it is a space that offers an in-depth look into the craft of cooking, where the “production, literature and experience of food come together,” said Lee Mee-young, vice president of the credit card company’s brand division, at the press opening Wednesday. Open exclusively to Hyundai Card members, the container box-shaped building is located in a quiet corner of Gangnam near Dosan Park, a cozy space that can hold around 80 visitors. 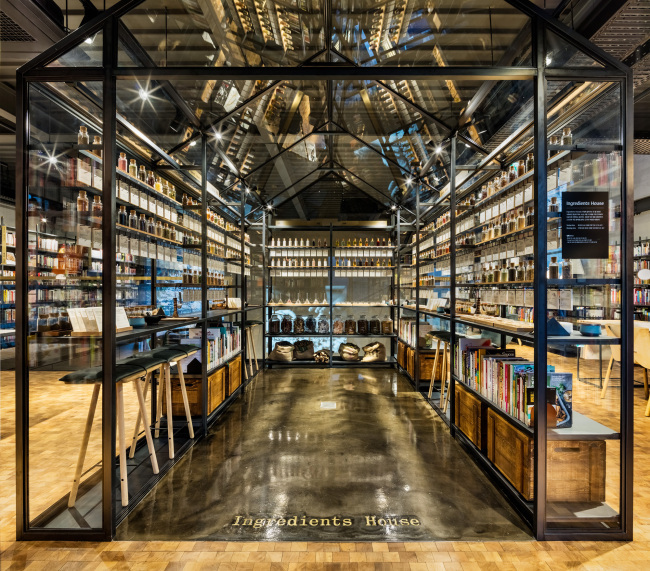 It is the last and most recent installment in Hyundai Card’s “library” series, made up of spaces throughout Seoul devoted to different themes. The Design, Travel and Music libraries were all built as centers of inspiration and thought in their respective areas. On the first floor of the new establishment is a deli that serves sandwiches, pasta, beverages and a selection of condiments. The second-floor library houses some 16,000 cookbooks -- 70 percent of which are in English -- and a glass-walled room where visitors can smell and taste over 100 different spices. The third floor holds a kitchen space with eight separate cooking stations, where visitors can cook using ingredients and recipes provided by Cooking Library. On the fourth floor is a greenhouse-like dining area for private parties. A small garden of vegetables occupies the rooftop terrace there, overlooking the Dosan Park area. In the basement is the kitchen, where a team of chefs prepare meals to serve on the top floor. 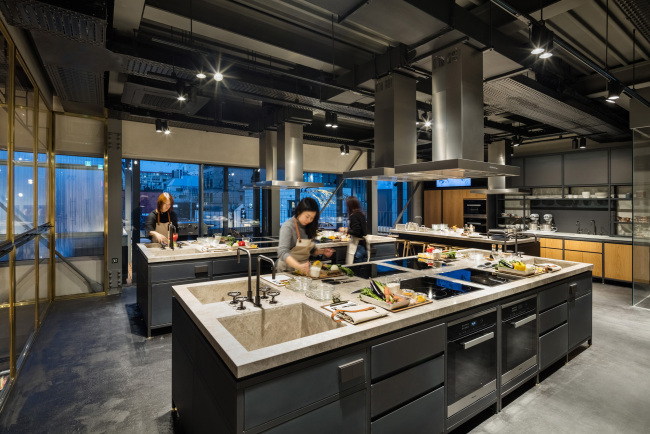 The building has been strategically designed so that the smells of cooking waft through all floors, according to its architect Choi Wook, a partner at One O One architects. “I envisioned a space where the scent rises up,” he said. Open ceilings were built between each story for a feeling of openness and cohesion. The building’s outer appearance, meanwhile, is gray and rectangular. “I imagined a mom’s kitchen inside a container box storage unit,” said Choi. 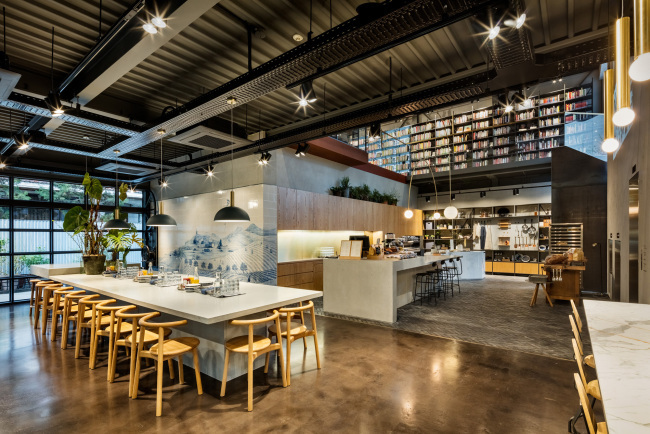 Interior elements were also inspired by cooking, according to CEO Tim Mutton of Blacksheep, the British studio that carried out Cooking Library’s interior design. The wooden flooring reflects a butcher’s chopping board, while the marble walls are reminiscent of a kitchen countertop, he said. “We focused on three distinct, simple values: time, the new modern day luxury; tactility, to give the feel of analog; and craft, because we wanted to highlight integrity,” Mutton added. Hyundai Card hopes the new space will serve as a hub for cooks, aspiring cooks and home cooks in need of kitchen facilities, an official there said. Cooking Library opens to the public Friday. Visitors will be able to enjoy the deli, the library and self-cooking stations upon its opening. The fourth floor dining area and cooking classes will become available in the coming months.